Each trip is a different experience. When choosing a destination for a holiday there are several things that must be taken into consideration according to the selected destination to ensure that the experience is as relaxing and enjoyable as possible. From the type of clothing that is included in your baggage for the weather to the route to follow according to the attractions available. The choice of the type of vehicle you rent, is not the exception. It is not the same to holiday in an urban environment, full of paved roads and in a rural environment where you can not anticipate the type or condition of the roads. To travel to the mountainous areas it is best to choose the right vehicles, ensuring that nothing can delay the traveler or interrupt the vacation. It’s best to find vehicles with a powerful engine and the best vehicles for the mountains have enough power to dominate the climbs since in these gravity will slow them down. The heavier the load or incline of the climb the more it will be necessary to use low speeds (1st and 2nd) to climb up. Furthermore vehicles for the mountains should have an excellent braking system or ABS as antilock brakes, since the steep slopes result in an increased speed which requires proficiency in the use of appropriate speeds, an excellent braking system and appropriate use of techniques for braking. The height of the rental car is also a factor to consider when choosing mountain vehicles, a car of greater height is preferable since they allow more stability and better road visibility and conquer unexpected obstacles such as country roads or farms, muddy terrain, terrain irregularities, including unexpected road conditions. For this it is also essential to choose vehicles with four-wheel drive or 4×4, this ensures that the driver will have greater control of the vehicle on hilly or slippery terrains, and that the force is distributed better for the vehicle. In our fleet you may choose 4×4 intermediate vehicles like the Daihatsu Beego, full size 4×4 like the Toyota Rav 4 and the elegant and powerful 4×4 premium like the Toyota Prado. Finally, space is also an important feature when choosing mountain vehicles, since these trips usually require more amount of luggage and special clothing to protect yourself from the rain or cold; they usually occupy a greater amount of space. Costa Rica offers beautiful mountain destinations near the sea, by the geographic conditions of our country. 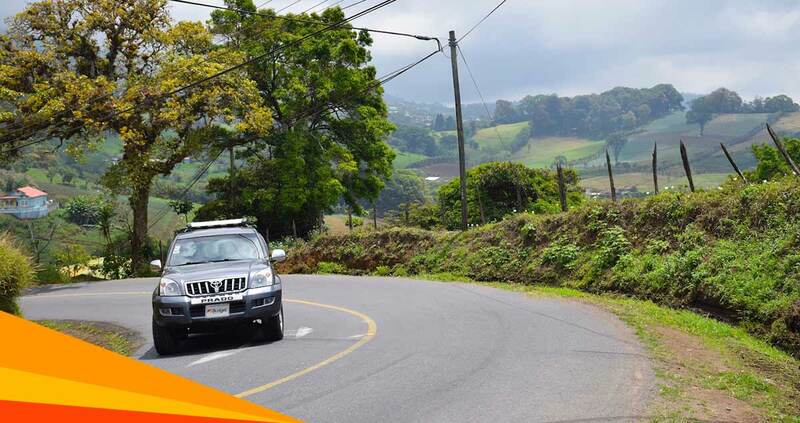 You can penetrate mystical places like Monteverde or San Gerardo de Dota or on the slopes of Cerro Chirripó, which are pure mountain to places like Puerto Viejo, Quepos, Drake or Guanacaste, where the mountains are near the sea and roads are better with a 4×4 vehicle. You don’t know which one to choose? Visit our Fleet section to get to know them and choose the one that best suits your type of travel.